I have to admit that I don’t drink a lot of white wine in the dead of a Minnesota winter. But when I saw a sample of the almost mythical Smith-Madrone Riesling, I had to see what was in the bottle. The last time I tasted Smith-Madrone Riesling was a tank sample with winemaker Charles Smith. I think this was from the 2007 vintage since my impromptu tasting visit was a few years back. Over the years, this wine has been my personal benchmark of how good Riesling can be in my home state and rarely is eclipsed by any other California Riesling. Smith-Madrone was founded in 1971 by brothers Stu and Charles Smith. The Madrone part of the winery name is a tribute to the most prominent tree on the 200 acre ranch. For 40 years the Smith brothers have made uncompromising wines from Riesling, Chardonnay and Cabernet Sauvignon that are among the finest in Napa Valley (a Pinot Noir was also produced for a time but grafted to Chardonnay in 1989). Grown at between 1,300 and 2,000 feet on Spring Mountain, the 6.25 acre Smith-Madrone Riesling vineyard is now 38 years old. When I visited in 2008, the vineyard was challenged with phylloxera which slowly diminishes the quantity of fruit. As vines bare too little fruit they are being replaced with resistant rootstock. The 2009 vintage was the coolest since the Smiths planted the vineyard harvesting 10 days later than normal. Even if this is the lowest production they have ever seen from this vineyard, the quality is still top-notch. 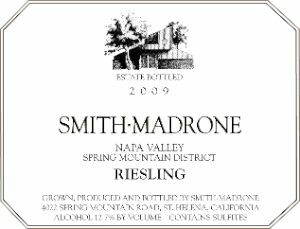 Smith-Madrone, Riesling, Spring Mountain 2009 ($27/sample) – Light straw-green in color with aromas of green apple, citrus, honeydew and a hint of petrol. 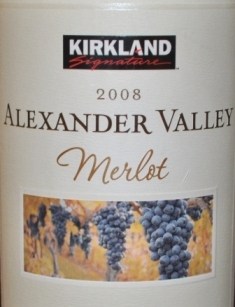 Tart green apple fruit with citrus finishing dry with refreshing acidity and a nice mineral note. A benchmark California Riesling that could take on the best of Alsace and give them a run for their money. 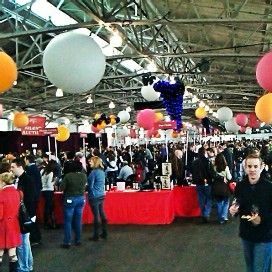 Will continue to improve in the cellar for at least the next 25 years. Just over 300 cases produced so pick up some soon.